Home » »Unlabelled » This man was forced to marry two women at the same time—after he was busted for dating both! This man was forced to marry two women at the same time—after he was busted for dating both! 22-year-old Razul Timbukong is now the talk of their town, after the latter was forced to marry two women who were fighting over him. Just recently, Timbukong tied the knot with his wives; Jarah Mendoza Labangin, 20 and Thelma Guipal, 24 in an unconventional wedding which was held in Sampao Lutayan, Sultan Kudarat in the Philippines. Apparently, Timbukong was in a long-term relationship with Labangin for years now. When they were about to tie the knot, Thelma Guipal suddenly showed herself, claiming Timbukong had promised to marry her as well—and she wouldn’t allow the wedding to go on. Labangin’s parents were enraged and would no longer allow their daughter to marry Timbukong. Equally enraged, Timbukong’s family refused to stop the wedding, as they have already spent so much for the wedding preparations and dowry. 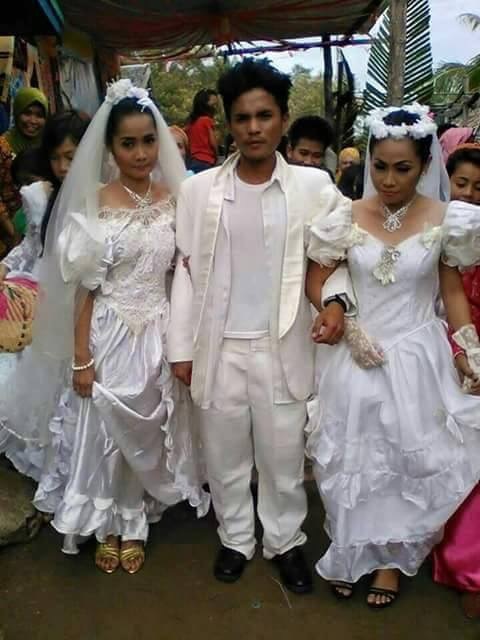 In the end, the love triangle ended in a Muslim wedding ceremony, where both women were married to Timbukong. For months, the newlyweds settled under one roof. However, one of the brides left and stayed overseas for good.